How specific are larynx models in showing the various complications and problems that can occur within the vocal cords and surrounding tissue? Larynx models are not specifically designed to show the various complications and problems that can occur within the vocal cords and the resulting problems in vocalization. Instead, the model is designed to show the structure of the larynx and its relationship to the thyroid. The model will show the vocal cords on the model as well as the thyroid membrane and cartilage, cricoid cartilage, trachea and the hyoid bone. Understanding how the larynx sits in relation to other features of the airway and how it functions to allow sound is essential in understanding the consequences of different types of pathologies or damage. A doctor or speech therapist can use the model to inform the patient of the structural components that relate the larynx, which will important to understand the long and short term treatment goals. What other anatomical features are present on larynx models? The larynx, or voice box is a complex system of muscles, tissue and cartilage that creates air volume, pitch and sound and allows humans and other mammals to be able to create sound. The larynx is actually formed of a variety of features that are all shown on larynx models. These include but are not limited to the cricoid cartilage, thyroid cartilage, thyroid membrane, and the top of the structure, the hyoid bone. It will also show the trachea that forms the lower end of the larynx. The anatomy model will be an exact replica of a human larynx and anatomically correct from all perspectives. Very fine, identified parts of the larynx model will be highly visible even if they are not uniquely identified on the model. With additional study and in the case of specific conditions these additional features can be labeled or identified for patients. 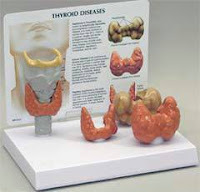 Another major component of larynx models is the thyroid. The thyroid, which sits over the larynx at the base, controls the body's metabolic system as well as controls the production of a variety of hormones including growth hormone. What other types of educational materials can be used in conjunction with larynx models to help patients to understand short and long term rehabilitation and speech therapy goals? Many non-cancerous conditions of the larynx can be very successfully treated with speech therapy instead of surgical procedures. These include strains, overuse issues, muscle control problems and even air volume problems. Larynx models used in conjunction with posters and video presentations on how the larynx works and how muscles can be taught to correctly function are excellent options for a speech therapist. Even in some medical conditions such as acid reflux or polyp removal surgery the use of speech therapy is typically recommended after the surgical procedure. The more information sources that are used to help the patient understand the short and long term goals of the therapy the more successful it is likely to be. Anatomical models are a great way to ensure that the patient has a thorough understanding of what is going on with his or her health.